A traditional and delightful Greek Cypriot custom is the offering of spoon sweets to guests as a symbol of hospitality. They are called spoon sweets because the usual serving size is a well-filled teaspoon. Spoon sweets are popular both in Cyprus and in Greece, usually served with Greek coffee and a glass of cold water. They are usually offered to guests in a small china or crystal dish or bowl. To this day, spoon sweets remain a traditional offering, literally a sweet welcome for the visitor to the friendly environment of a Cypriot home. These sweets may also be tasted at the traditional village coffee shop (kafeneion) or used as toppings in home-made cakes. Over the past centuries, travelers and writers have commented extensively on the Cypriot hospitality and on many occasions tying this with the habit of offering visitors home-made spoon sweets. In the mid-19th century (1862-65) French traveler and architect Edmond Duthoit was impressed in tasting ‘the traditional sweets offered to him at the welcoming ceremonies’1. Citrons made into spoon sweets were a unique experience for Archduke Louis Salvator2 who visited and stayed in Nicosia for some time during the 1880s. A long description of the welcoming process in the Greek Cypriot homes during the late 19th century is given by Magda Ohnefalsch Richter3: ‘When one visits a Greek Cypriot family… he is welcomed with the home-made glyko, the sugary fruit, which is served on a silver dish along with a glass of water and a cup of Cypriot or Turkish coffee. In the preparation of these sweets, Greek Cypriot women are leaders, making an endless line of these excellent sweets from almonds, walnuts, peaches, cherries, dates, rose petals, orange, lemon blossom and many more’. In the past, spoon sweets were homemade in small quantities, according to the art and secrets of each housewife. Grandmothers passed the recipes down to their daughters and the younger girls watched until they were old enough to help. The sweets were something that every village woman had to know the art of making in order to be a successful housewife. It takes time and patience to make spoon sweets, so it should not be a surprise that it has always been considered a woman’s work. Today, few women have the time and know how to make their own spoon sweets. Luckily however, the art of making them is still alive and one can find and taste such sweets almost everywhere in Cyprus due to some quality oriented processors who devote the time and effort needed to continue the tradition. These rather small in size, village enterprises today make up the spoon sweets industry, supplying the local and export markets. These enterprises are headed by village women who are committed to the preservation of traditional recipes and have developed the skills of commercializing the production of spoon sweets. Over the course of time they learned how to run businesses and educated themselves with regard to marketing their products. Traditional homemade spoon sweets are now widely available through these small manufacturers who are serving the local market and are constantly trying to tap into international culinary market. Most of the sweets are prepared at the time of year each fruit matures (often slightly underripe): apricots, bergamot, citrons, lemons, watermelon, cherries and figs following each other from early summer to late autumn. 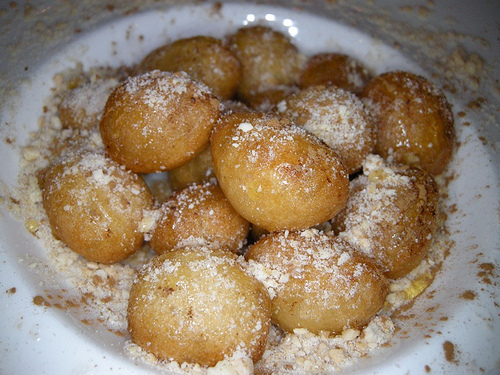 Other sweets made from walnut and bitter orange use fruit that is not yet fully ripe. Sometimes spoon sweets are made from vegetables (such as eggplants and courgettes) or from rose flower petals, a very famous spoon sweet made in the village of Agros. Many of these sweets are made from fruit parts that are normally inedible, such as citrus peel, watermelon peel, unripe walnuts or sliced citrus fruits with their peel intact. 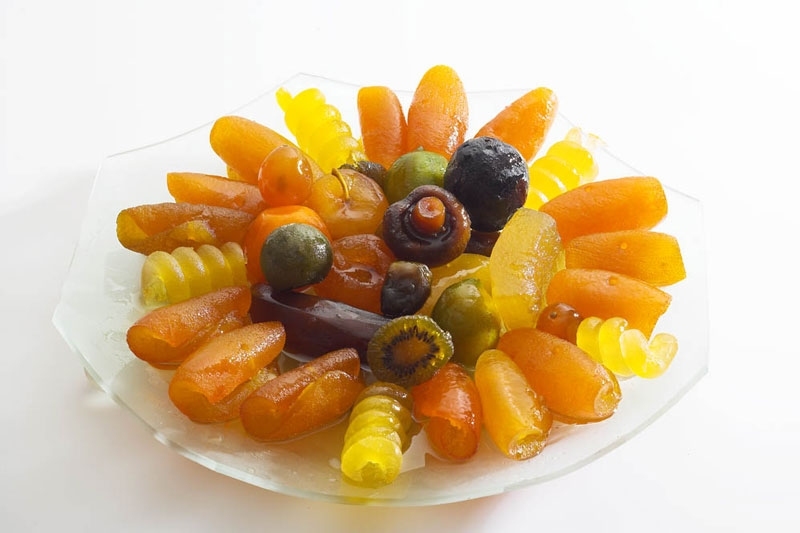 Spoon sweets are made with simple, natural ingredients, mainly fruit and sugar with a touch of lemon juice added to preserve the fruit’s original color, as the citric acidprevents oxidation. 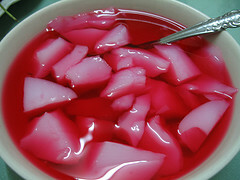 They are made by slowly and gently boiling fruit in water and sugar over several hours or days, until the syrup sets. The making of each sweet has its own technique and follows specific rules of preparation and execution. A well-made spoon sweet should retain the original shape, color, aroma and taste of the fruit. It is impossible to provide a single recipe for all spoon sweets. The liquid and sugar measurements vary according to the type of fruit or vegetable used. The fruit should remain firm and sit in a nice pool of syrup thick enough to coat a spoon. Any additional aromatic ingredients should be added towards the end of the process so as to retain their aromas. Sweets are made using simple, natural products and processes, without the addition of chemical stabiliser or preservatives. This invariably leads to a higher risk of product alteration during storage, which however does not necessarily imply that the product must be thrown away. If the spoon sweets turn sugary, empty the glass jar into a pan with 3-4 spoonfuls of water and bring to the boil for a few minutes. At the end add 1 spoon of lemon juice. If the spoon sweets turn sour we try to heat up the product into a pan with its syrup. In cases where the sour is too much then the product must be thrown away. A diverse range of spoon sweets is produced in Cyprus, Greece and in other parts of the world. However, the island of Cyprus is famous for a few distinct spoon sweet products that are uniquely made by local women, using simple, traditional methods inherited from the mothers and grandmothers. Walnut spoon sweets are a specialty of Cyprus made from unripe walnuts, sugar, cinnamon and dry carnation stalks. The walnut sweets are one of the most unique traditional sweets and their way of making requires a few days of heating and cooling and a great deal of experience and attention to detail in achieving the ideal texture and taste. Apricot spoon sweets are made from firm apricots that have been de-stoned and the art of its production lies in achieving a spoon sweet that remains firm for a long time. They are excellent with custard cream or topped on fruit yogurt or ice cream. Cherry spoonsweets are a favorite made in early summer when the cherries are at their best. This is one of the most colorful of the spoon sweets, turning into a delightful clear red when finished. The hardest part of the preparation is removing the pits from the cherries. A cherry pitter, a cherry stoner, a large sewing needle, or paper clips are often used to remove the pits. They can be served alone with a glass of water, with a cup of coffee or spooned over yogurt or vanilla ice cream. Watermelon spoon sweet is made from the thick watermelon peel that has been completely cleaned from the red flesh. It is cut in rectangular or trapezium shaped pieces and placed in a lime-water solution for a few hours. The process that follows is fairly complicated and requires knowledge and expertise. The end result is a crunchy fruit sweet that is best served cool from the fridge. Rose spoon sweets are made from the pedals of the famous wild roses (wild rosa damascena) that blossoms and is hand picked each April. The village of Agros is the place best known for making rose sweet since the wild rose plant is found in abundance in the surrounding hills. It is made using the traditional recipe with no added preservatives. It is claimed that it possesses therapeutic attributes, contributing to the proper functioning of the intestine. Baby Eggplant spoon sweets are made by using very small eggplants that are scored with a sharp knife, and slightly cooked. Then they are drained and dried, and a blanched almond is inserted deeply into the pulp. The syrup is made using three parts sugar to one part water, cloves, a cinnamon stick, and lemon juice.